It might seem hyperbolic to claim that Brett Hundley’s career is on the line after just two NFL starts. However, the modern NFL is a ruthless business for young quarterbacks. Everyone knows that the quarterback position is overwhelmingly the single greatest determining factor of a team’s success. With hair-trigger NFL owners ready to pull the plug on head coaches, teams cannot afford to invest significant time in young quarterbacks who do not show at least some serious sparks or flashes of starting-caliber talent. Simply put, these young men are given a very small window of opportunity to exhibit their ability. That very small window becomes the litmus test for a quarterback’s career. If a coaching staff has not been convinced that their guy has the “it factor” then they simply cannot invest significant time into a player in order to wait and see how they progress. It’s time for the next prospect to be given his shot. 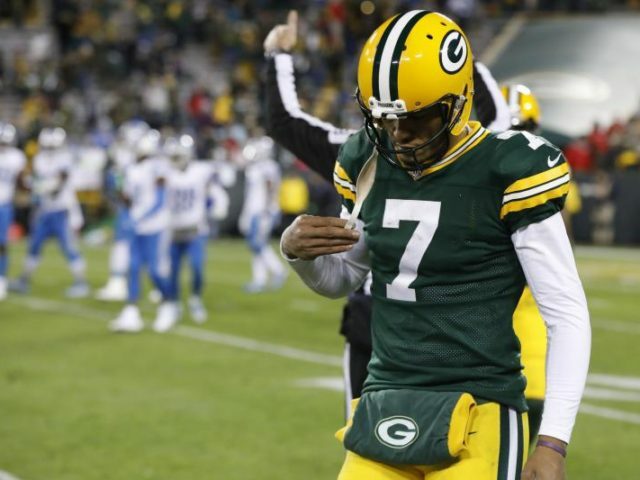 It’s not that Brett Hundley could not develop into a quality NFL quarterback. It’s not necessarily future talent that is going to determine the future of Hundley’s career. Instead, it is how Hundley is performing now. Unfortunately for Hundley, how he is performing now is not necessarily a good indication of how he might perform in the future. Peter Bukowski writes that, “Two starts are not enough to decide whether Brett Hundley is garbage,” and that’s true. However, fair or not, this is simply not how the NFL operates. Consider Hundley’s value on the NFL market. Given some promising preseason performances throughout his three year career, there was some serious buzz about Hundley before he was thrust into the spotlight after the injury to Aaron Rodgers. It was widely assumed that Hundley could have garnered a mid-round pick based on the buzz alone. Many thought that Hundley’s stint as a starter would be enough to guarantee the Packers a second or even first round pick for Hundey. One NFL exec said the Packers could've had a 4th-round pick for Hundley last spring. In other words, two poor starting performances has been enough for the NFL market to turn it’s back on Hundley. Fair or not, no one is interested any more. Perhaps this is the reason why quarterback play seems to be down in recent years. The best quarterbacks in the league are all in their mid to late 30s. Rodgers, Brady, Brees, etc. are all quarterbacks from a previous generation. And for every young success story like Dak Prescott one finds a heap of quickly discarded yet once highly-lauded prospects like DeShone Kizer. On the bright side, Hundley has one important thing going for him: he finds himself in a situation which is going to provide a longer window of opportunity than most young quarterbacks are afforded. Aaron Rodgers will not be returning for at least another five weeks, and it’s significantly more likely that he’ll remain out for the remainder of the season. Moreover, the Packers are committed to Hundley. The trade deadline has passed, and the team is uninterested in anyone that could be pulled off the street. That means that Hundley will likely have eight more games to turn the league’s view of him around and bring his career back from the brink. Imagine if Hundley played for the Cleveland Browns. Even if he were a rookie, he’d already be on the verge of being benched if he weren’t riding the pine already. It’s unfair to Hundley to compare him to Aaron Rodgers. Still, there are a lot of similarities between the start of Rodgers’ rise to super-stardom and where Hundley finds himself now. Both players had the opportunity to spend three years learning the game behind a Hall of Fame quarterback. Both players were also abruptly thrust into action in their third season when that veteran quarterback went down with an injury. The similarities end there, however. In 2007, Rodgers took over for an injured Brett Favre in Week 13 against the Dallas Cowboys. Rodgers didn’t get the win, but he threw for 201 yards, 1 TD, and 0 INTs, good enough for a 104.8 QB rating. Moreover, he brought the Packers back from a 17-point deficit to finish the game down just 3. In that single game, he flashed his ability to be a starting-caliber player in the league. That single performance was likely a large impetus for Ted Thompson’s decision to usher in the Rodgers-Era the very next season after Brett Favre’s un-retrirement. Flash-forward to 2017. When Rodgers went down in Week 6 against the Minnesota Vikings, Hundley came in and threw for 157 yards, 1 TD, 3 INTs, and finished with an abyssmal 39.6 QB rating. In Rodgers’ first two games as a starter, he threw for a combined 506 yards, 4 TDs, and 0 INTs. Both games were Green Bay victories over division rivals. In Hundley’s first two games as a starter, he has thrown for a combined 332 yards, 0 TDs, and 1 INT. Both games were overwhelming losses. Hundley doesn’t have to be Aaron Rodgers good. He doesn’t even have to be as good as Rodgers was in his first few games as a starter. However, if he wants any kind of shot at being a meaningful player in this league, he needs to begin to show that he can consistently throw the ball down the field and lead his team to some victories. Luckily for him, he has some time to resurrect his career. But the clock is ticking. This entry was posted in Authors, Packers 2017-2018 Season, Seasons, Taylor O'Neill and tagged Aaron Rodgers, Brett Favre, Brett Hundley, Green Bay Packers. Bookmark the permalink. The way Hundley is going he might be out of the NFL before the 2017 is even over!